Our fabulous clients continually remind us that hiring us was a fantastic investment in themselves. They have appreciated our approach - a co-creative process, getting custom advice, and out of the box solutions and guidance that comes with over 17 years experience working as a community and corporate consultant across nutrition, corporate health and occupational health, in the Non-Government, Government and private sector. These testimonials will give you an insight into the benefits you'll experience. Case Study: We helped this small business owner save double handling and in the process improved tracking the progress of their business. You are a legend!! I feel and am on top of the world. It will take me a while to catch up on old items and things to do. But everything since the day you left is up to date moving forward. I just need to work on checking my emails more often! Your planner works great and the mobile office is awesome!! I will get you to come back soon as what you have achieved for me in such a short period of time is awesome! Thank you so much Louise! I was a mess of paperwork, behind on paying bills & could not find anything quickly. I thought I had a filing system that was ok but nothing was working. I would get upset because of the amount of work but never knew where to start. When Louise said we had the meetings over Skype (I am in Dubbo NSW) I was very doubtful of how this was going to work, I had heard good things about Louise so I wanted to give it a try. What I liked most was how easy it was, it took time to set up the filing system but Louise sent me the tags that she had made up for me so that saved time. Everything was made easy as even the few things I had to buy I had a photo of so I knew what to look for straight away. My filing system is now so easy. Everything has a place including projects I am working on. I have a desk that does NOT have loose paper everywhere. If anyone needs anything it is 2 mins to find it instead of an upset hour. I have learnt what to delegate & that I am better at my job when I have a clear mind & organised office. I am so thrilled with how I am now feeling and how everyone is working better around me. I would recommend it to anyone in business who is feeling overwhelmed with the mounting paperwork, time management, anyone just wanting to get organised. Mainly if I could suggest to any new business starting up to get Louise in to help set the office up at the beginning. Setting up properly at the beginning would save time and stress later on. ​As an entrepreneur, I value working with a professional, after all there are only so many seconds in the day. I would have wasted at least 48 hours trying to organise my wardrobe myself, and would never have gotten it so right! Right from the get go, you were helpful and I knew from the pre-work we both completed, compared to others, you offer a well thought out and sophisticated service. You were immediately focused on understanding my problems and needs, and the solutions you suggested during the planning phase were perfect. I loved how you completely nailed the brief even before you arrived on my doorstep. You were so well prepared with all the products and I now have a system and an amazing wardrobe space that gives me peace and the perfect start to my day. Everything is in its place and because I was involved in co-creating the system, I am finding it so easy to maintain and stay organised. Without you I would never have achieved what we did in that short period of time, once again reiterating why it’s worth the investment to work with an expert! What are the most stressful things in life? Moving house is one of things near the top of such a list. When faced with moving there are so many factors to juggle, just a small part of the process is the actually packing of boxes. Imagine if instead of the packer horror stories we’ve all heard, you had someone who actually “gets” stuff. Someone who values your homes’ contents as you do. Someone who knows not to pack the rubbish that you’ve got left over from the last school fete but lovingly itemises all the good stuff so it’s labelled to be unpacked based on the new house. It does sound too good to be true but this wonderful service was what I enjoyed when I sourced Louise D’Allura from The Revamp Experience. Louise didn’t just pack, she sorted, organised, supported and above all – got it done to deadline. With the packing done, the removalist service was simply boxes and furniture. I can highly recommend The Revamp Experience. The prices of a full pack and move compared to using The Revamp Experience for the packing was highly competitive and the service and attention to detail overwhelming better. Louise made the stress of packing a positive experience. Every box I opened in my new home was full of our things that had a purpose and a place in our new home. Not one thing broke, and due to a delay in our new home being ready, I could find the few extra things that were needed urgently very simply due to the inventory Louise prepared. If you are the corporate type who needs the house packed while away on business, the busy multi-tasker juggling children, work and moving, or simply want a hand to pack your things your way, The Revamp Experience will not disappoint. Their service will exceed your expectations (even after reading this) and you will not just be able to find everything when you’re unpacking, you will have left behind the clutter and have a new home full of the things you love. Yes I could have cleaned up my office/junk room myself (probably not as well or as quickly), but at the end of the day it would have been "tidy", but not organised, and definitely not a space that helped me. I am so thrilled with what you have set up. You will be delighted to know I have already utilised your filing system on numerous occasions for items that otherwise would have been the 'kindling' for my next paper work pile. It has given me a real kick to know there is somewhere to put things, and to know I will save so much time when I go to look for them again. I have thought of a couple of extra things to add so I will be off to Officeworks this week for a couple off extra hanging files, but otherwise it's great. 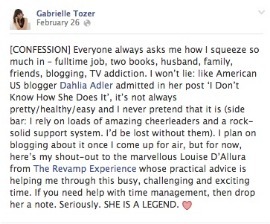 I was thrilled to hire Louise D’Allura in July 2011 (via Skype, as I live 10 hours away) to Revamp my office and help prepare for what I now call my "most organised moving-house experience ever". Louise’s enthusiasm energized my whole family! Her stunning ideas and systems also made the move so much easier with very little impact on our home-based business. Going forward our business and home continue to benefit from her expertise and we are incredibly grateful for her giftedness. Several months later I was pleased to invite Louise to deliver workshops with me at the Small Business Centre – East Pilbara in Port Hedland, Western Australia. Louise added great depth to my workshops in the areas of delegation, time management and productivity. I have no hesitation in recommending Louise and look forward to working with her on many more exciting projects. Thank you so much for your help with the move. There is no way I could have done this without you. I really appreciated the organisation, thoughtfulness, and thoroughness throughout the massive project that you gave me. Thanks again. You’ll be so proud! We had our first ‘strategic’ meeting today. We have put together a list of the things we know we have to do next year and prioritised the first few things…. (and we’ll) ask you to come in for one of our meetings to help us out. I knew I needed to work with a professional to help me get stuff sorted. I run my own business and so I didn’t have enough time or motivation or enthusiasm to work out what I needed to do and do it. The sessions were really productive and I saw results – I knew I wouldn’t be able to do this on my own as I just would not have made it a priority. The paper system we implemented was very exciting it works really well and I am processing paperwork easily and am able to identify when I might need a new system to deal with new situations as they arrive. My office looks so much better at the end that it is really exciting to be in it. The office is much more workable and getting rid of old files has been a huge relief. I recently had to retrieve some old tax documents and it was so easy to grab the exact file I needed. Anyone with a home office who doesn’t have time needs this service – Louise provided a stellar service. I knew what I wanted to do, and initially it was hard to justify the cost, and truly appreciate the value at the outset. I know now I could have done this without you. Your approach, positivity, and enthusiasm has always been so encouraging. Strangely enough you helped me to be nicer to myself. Since working with you you’ve helped me realise how the decisions I’m making now will have consequences – what I buy will end up somewhere. I think about this now before I buy things – even though I see things I actually stop and ask it might be a bargain but do I really need it, where will it live? The same with groceries – I don’t buy what I don’t need. My buying habits have finally changed to reflect our budget – finally! I’ve been able to convince some of the family to look at the present choices they are making for my family this Christmas. They’ve chosen to focus on experiences that will create memories and mean more to my children. I feel like I have made changes to the way I think about stuff – and I am not as attached to possessions as I used to be. Busy women that need a bit more time, and feel overwhelmed could benefit from working with Louise. Each room we have worked on is great – My office looks so much better, the wardrobe has made a big difference and I could apply the principles and get the bathroom working really well. The kitchen is much more functional now and items have dedicated areas. I’m looking forward to my tune up session to keep me accountable and motivated! I am a very organised person but the one area where things got the better of me was my home based office. I felt overwhelmed by my office and needed to get some structure restored in it. Having met and spoken to you a few times I felt you were the right person for the job. I felt you would tell it like it is as well as listen to me and my needs as well. I knew you would take a collaborative approach. I was so excited to get my Action Plan and see my name beside tasks I could actually take immediate action on complete with time estimates. It was so satisfying to be able to cross things off the list! After our organising sessions I am now not looking through piles of stuff anymore. I can think logically about where it will be and find it. When I have paper I need to file I can make decisions about where it needs to go easily! Working with you has helped me save time and a lot of wasted mental energy! If you’re a business owner and struggling to see the forest for the trees, Louise can help you keep on top of things in a way that works for you. Did my admin stuff this morning and could place my hands on stuff pretty much straight away. Emptied my Arrivals lounge and email action folder and nothing in the Wednesday Admin Task was urgent so left it all till next week. Also filed all the stuff that I’d post-it-noted yesterday. Whoo feeling like I’m making great progress. Thx Coach! If you haven't met Lou you don't know what you are missing out! When my sister first asked me to use her, frankly I felt guilty for using someone else to organise me. I thought its something I can be in top of if I spent sometime on it. But I ended using her once to organise my day and haven't looked back. She has a wonderful personality, I use her for Everything now! She has changed my life. I want every mum to have her every so often and don't do much without her green light!